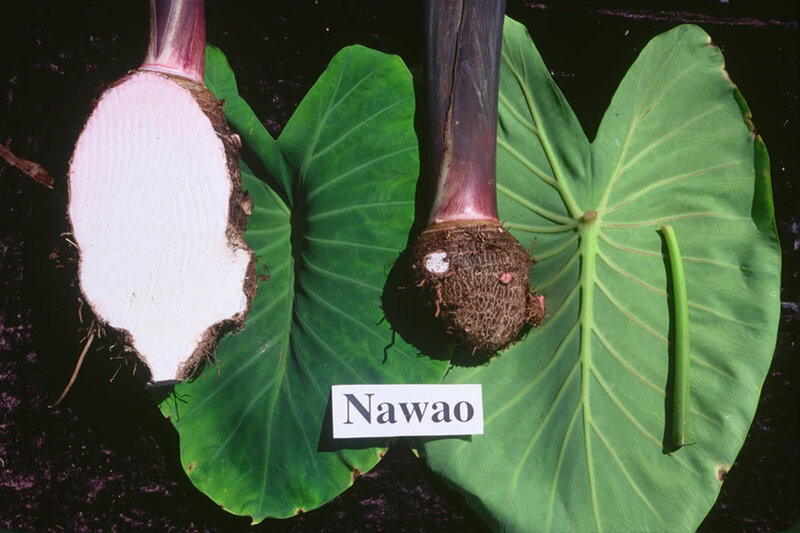 General Characteristics: Short to medium in height, moderately spreading, maturing within 9 to 12 months, producing from 5 to 10 oha; characterized by whitish corm flesh and purplish-black petioles shading into yellowish-green at apex, with red edges. Petiole: 55 to 75 cm. long, purplish-black shading into yellowish-green at apex, red at edge, a dark pink ring at base with light pink for 3 to 4 cm. above. Leaf blade: 35 to 45 cm. long, 30 to 35 cm. wide, 30 to 35 cm. from tip to base of sinus, subovate, fairly firm in texture, dark green; piko light yellowish to light brownish; lobes acute with deep, wide sinus. Corm: Flesh white with light pinkish tinge, especially near apex, and yellowish fibers; skin pink. Inflorescence: Peduncle light yellowish-green with brownish flecking at base; spathe 18 to 23 cm. long, the lower tubular portion 3 to 4 cm. long, light green tinged with purple at base, loosely rolled and sometimes slightly open, the upper portion clear deep yellow, open near constriction. Origin, and derivation of name: Native variety; nawao means "that which is bad" and may indicate that this variety had a poor reputation as a poi taro among the Hawaiians. Distribution: Found occasionally under upland culture in Puna, Hawaii.